There was an addition to my kitchen lately; it was nothing other than a pasta maker. It was a surprise by my husband. The 2 trials he made for some spaghetti didn't yield a satisfactory result. I believe the recipe measurements were not followed correctly. Since then we didn't try any pasta recipes in the pasta maker. It’s simply sitting on the kitchen counter next to my stand mixer. I feel bad not trying a pasta recipe even though I cook pasta at least once a week for my family. 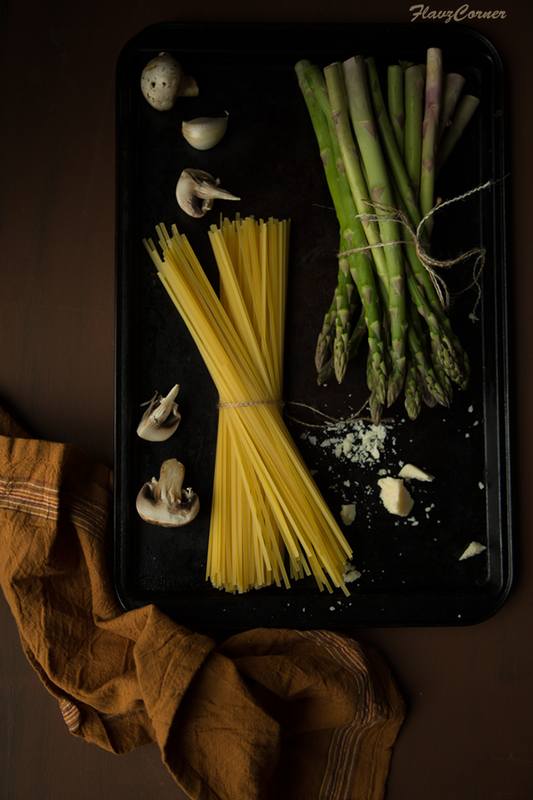 I would love to experiment with some 'from scratch' pasta recipes and share with you. Like I said, pasta is an easy fix up for dinner in my family. Let it be vegetarian or non-vegetarian, it is so versatile that one can tweak it according to their palate easily. My kids seem pretty happy when pasta is served for dinner. I have one less item to worry when it’s Pasta for dinner and the plates will be cleaned up within minutes. 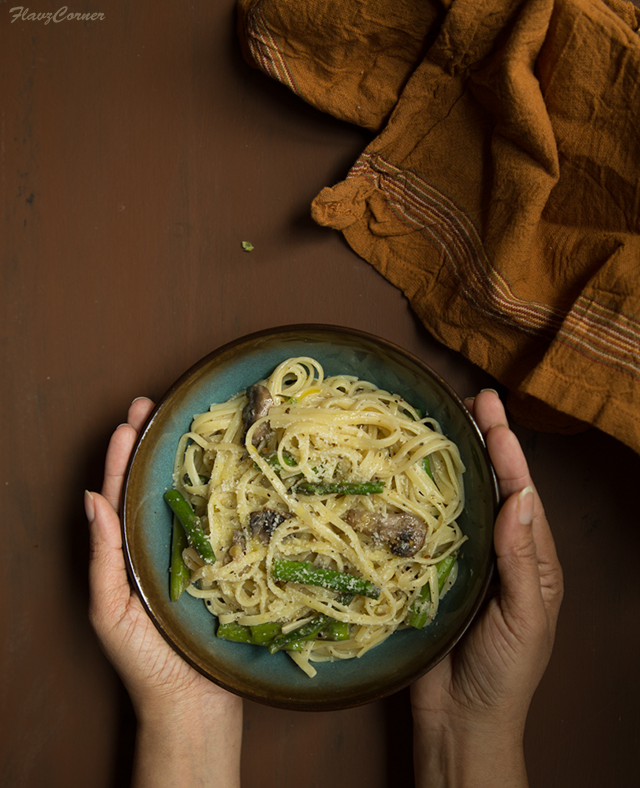 Here is a quick and easy creamy Linguine pasta recipe with Asparagus and mushrooms I make often. 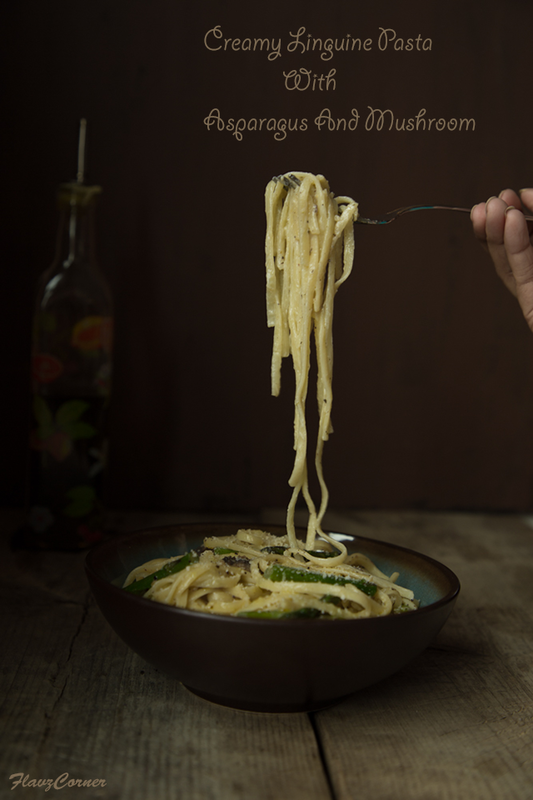 You can be as creative as possible when making this by adding any vegetables and pasta of your choice to this creamy sauce and viola a meal is ready in a jiffy. 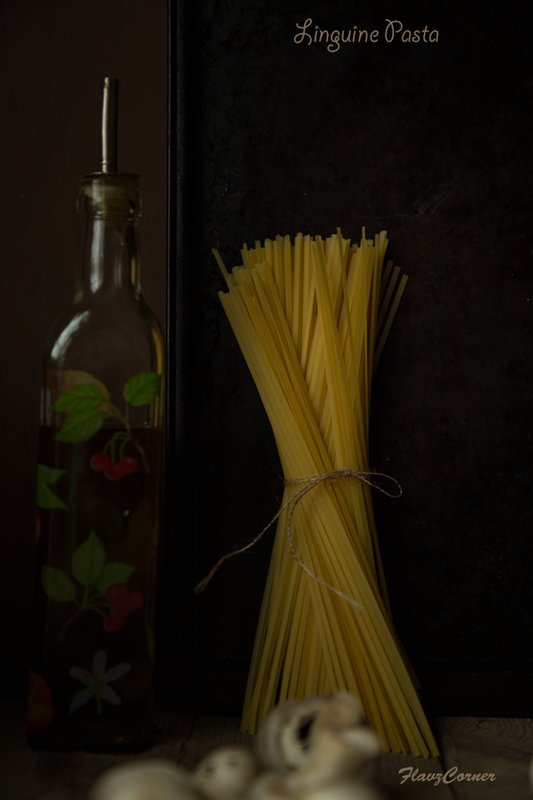 Cook pasta according to the package directions; strain, drizzle some olive oil and toss well. Take a heavy bottom pan and add 2 tbsp of olive oil and lightly brown the chopped garlic. Add the asparagus, mushrooms and seasoning and cook on medium heat till the water from mushroom is all evaporated. Adjust the seasoning and transfer the cooked veggies to a bowl. In the same pan, melt butter and add the flour and still well with a wire whisk to form a roux. Add the cream/milk and the Parmesan cheese. Stir well to form a thick sauce. Add the seasoning and adjust the salt and pepper. Lower the flame. Add the cooked pasta to this sauce. Mix the sauteed veggies and toss well. Turn off the stove. Drizzle some olive oil and top the pasta with grated Parmesan cheese. Enjoy while the pasta is warm. A simple and very satisfying meal! We eat pasta all the time, too. Lately I've been rolling it out by hand -- just seems easier than using the machine. Can't get it as thin by hand, though! More practice needed. :-) Anyway, this looks great -- thanks.